Human beings naturally ask questions…that’s how we learn about the world. Some questions are about simple facts; they have answers and we can find them. Another type of Question takes more time to figure out the answer and it involves thinking deeply. This type of question will lead us to discover different ways of thinking about the question. In fact, two good and intelligent people, with the same set of facts, could come to two different answers. So this type of question is the most important and it involves…critical thinking. The Question needs to be focused so that you know where you’re going. Make the question simple to understand even though it may be complicated to answer. define all terms that might be confusing. The clearer the question, the better your chance of answering it. 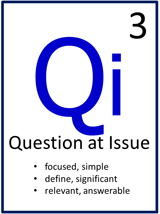 Make sure that your Question at Issue is significant: Is this really the question you want to focus on? It must also be relevant: Does it help us understand the issue we’re looking at? And is it answerable: Is it possible to find the answer at all? Consider all relevant Points of View …yours, the author’s, the artist’s, and other people who have looked at the same question. And remember: when you have answered the Question at Issue, you will be ready to achieve your Purpose.